The bulls pulled off a great feat on Monday as they propelled the S&P 500 higher on the open and throughout the trading day onto new highs. Alas, Monday ended, Tuesday started and the bears took back price action erasing all of the work the bulls did on Monday. Throughout the remainder of the week the bulls and bears duked it out without either making any real progress. The S&P 500 finished the week up .21%. Publicly traded markets move from trending (up or down) to non-trending (or sideways) consistently. Right now, the S&P 500 is back in the trading range that has formed since early June. Price did break to the upside, but failed and is now back in the middle of the sideways action. 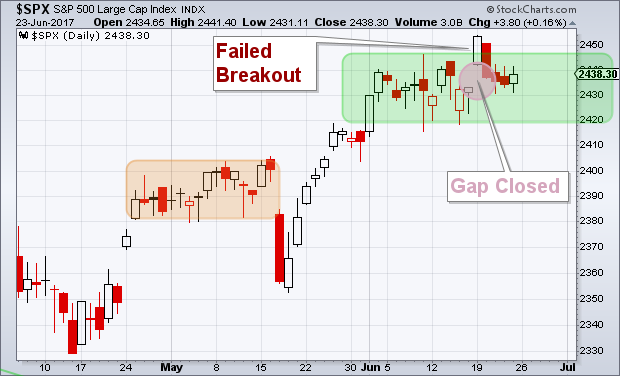 It seems like the bulls have a slight upper hand going into the week as the first target price of the bears was met by filling the gap in price developed by Monday’s price action. Also, a buy signal bar formed on Friday, but it is relatively weak. The bulls will want to see a strong breakout to keep their momentum moving. We have a couple different things going on when it comes to breadth. 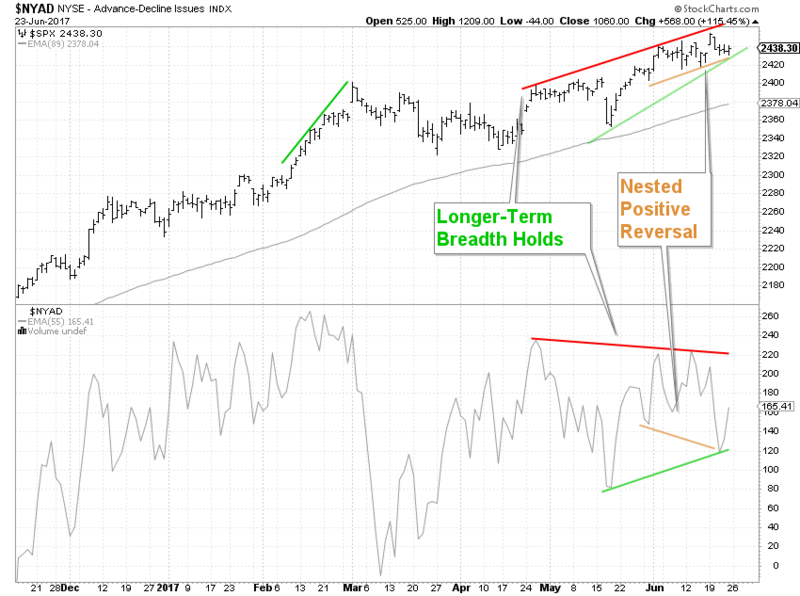 First is with regards to the longer-term breadth. The big picture breadth (defined by the red and green lines) is basically neutral since breadth and price are in line. Secondly, in the weeds of breadth we find that there is a positive reversal from the beginning of June (labeled as a nested positive reversal). These first item speaks to neutrality while a positive reversal is deemed as bullish for future price action. The major economic news for this week are the US GDP numbers for release on Thursday at 7:30 a.m. CST. They are expected to remain unchanged at a 1.2% annualized rate of growth. The long-term trend of the S&P 500 is still higher while the shorter-term is flat. Since a buy signal bar was formed on Friday, the trigger bar has a chance to be formed on Monday. There is still resistance around the 2450 range and support at the 2430 range. We will be watching to see how price behaves at these levels. Bears Deny Bulls – You Tube Channel in Full Swing!